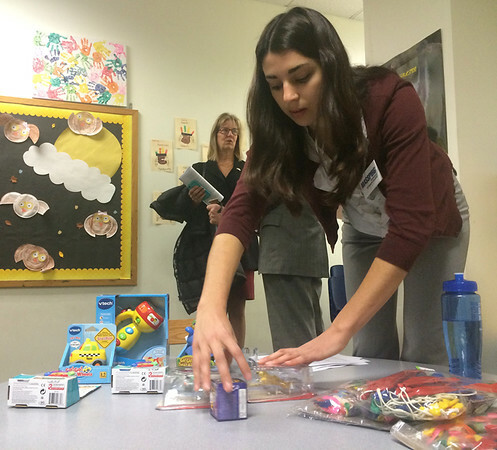 SALEM: Rachel Unger, campus organizer with the Massachusetts Public Interest Research Group, shows off some examples of dangerous toys on store shelves during a rollout of the group's 30th annual "Trouble in Toyland" report in the runup to the holiday shopping season. The report was unveiled at the Salem Community Child Care Center on Congress Street on Tuesday, Nov. 24, 2015. State Sen. Joan Lovely, D-Salem, who can be seen in the background, was also on hand.